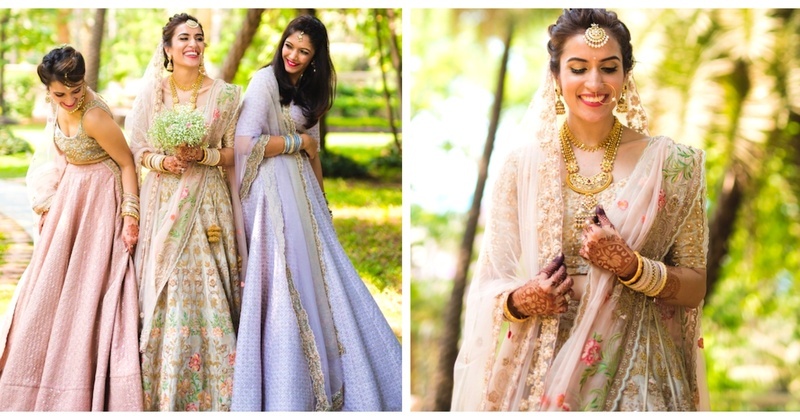 This top fashion blogger bride had the most gorgeous pastel lehenga shoot with her girls! If you are an instagram person and even have the slightest interest in clothes and styling, chances are you will know who Urmi Daga of What Wear How is. This digital influencer has been in the game since forever and has finally tied the knot and goes by the name - Mrs. Urmi Daga Shah now! So, what happens when a fashion blogger picks her own lehenga? I’ll tell you what, the outfit will be on point, it will be perfect for the weather / season and without any doubt will be a treat for the eyes. She completed the look with traditional golden jewellery (matching her latkans), a pearl maang-tikka (matching her embroidery) and matching bangles. I loved how minimal yet, totally phera-ready her whole bridal look is. A lilac lehenga from the pastel family with a sheer dupatta and a golden border, complementing the bride’s look. This other one wore a pastel-pink lehenga skirt paired with a grey-ish blouse, sheer dupatta and minimal jewellery. P.S., she pulled off all of her prep, from finalising the outfit to the wedding decor in just one month! Kudos to this bride who made this possible in a world where a bride takes 7 months to a year for planning her dream wedding. Bridal goals right? I can hardly wait for her wedding pictures to come out.